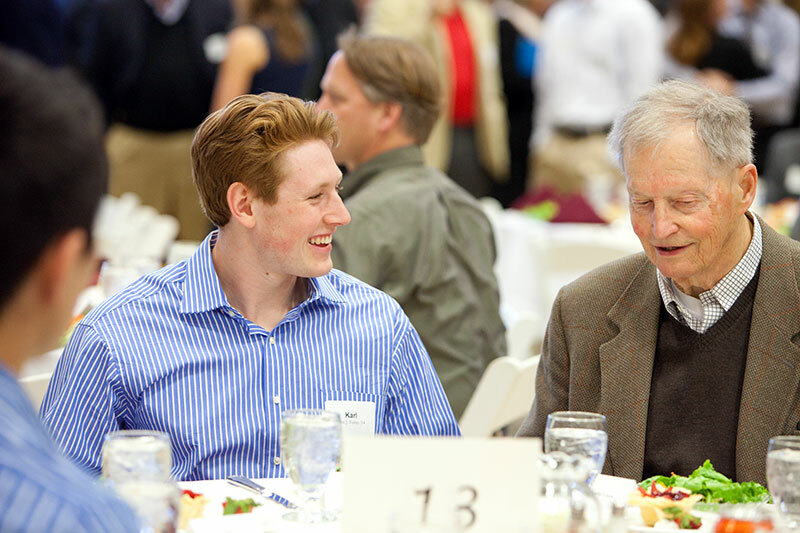 Karl Fisher '14, left, talks with Charles E. Clark '51 at the Mount David Society Scholarship Luncheon on March 30. Clark is the author of Bates Through the Years: An Illustrated History, published as part of the college's 2005 sesquicentennial. Romina Istratii ’12 of Athens, Greece, says she was fortunate to find Bates on the map when she did her college search. “And that is how it happened — I opened a map,” she said with a smile. Her quip, delivered at the Mount David Society Scholarship Luncheon on March 30, drew a warm laugh from the gathering of donors whose philanthropy helps to fund the college’s nearly $30 million outlay of scholarship aid each year. Indeed, the warmth radiating from the audience toward the several student speakers reflected something senior Jeff Beaton of Haverhill, Mass., said in his remarks. Each year, the Mount David Society Scholarship Luncheon, held in conjunction with the Mount David Summit, personifies the value and immensity of the Bates financial aid program. At Bates, four out of every 10 students receive college-administered scholarships. The average grant is $35,089, while the average financial aid package (including grant, loan and campus employment) is $38,700. President-elect Clayton Spencer addressed the intersection of excellence, access and financial aid in her very first public comments last December. With only a small percentage of U.S. families financially capable of paying the full price of a higher education of the kind offered by Bates, it’s absolutely essential to have a robust financial aid program to make that education available to the vast majority. “Bates is not an opportunity for the privileged; it’s an opportunity for any student who has the talent and desire to seize it and use it as a transforming piece of their lives,” Spencer said.